How is your summer treating you so far? It’s been a while since we had some lemonade up on the blog. And by now you know that I love love love lemonade and that I hardly drink anything else during summer besides homemade lemonade and some iced tea. So today I have some red currant lemonade for you. Clean and wash the berries and put them in a big pot. Add sugar and let sit for a bit so that the berries can get juicy. Add water and start boiling. Let simmer for about 15 minutes. Berries will loose their color and look very dead. Put berries in a strainer and catch all liquid. Then put liquid back on stove and let simmer until it’s syrupy. Wash your bottle with hot hot water. Fill in syrup, close bottle and turn upside down to seal. 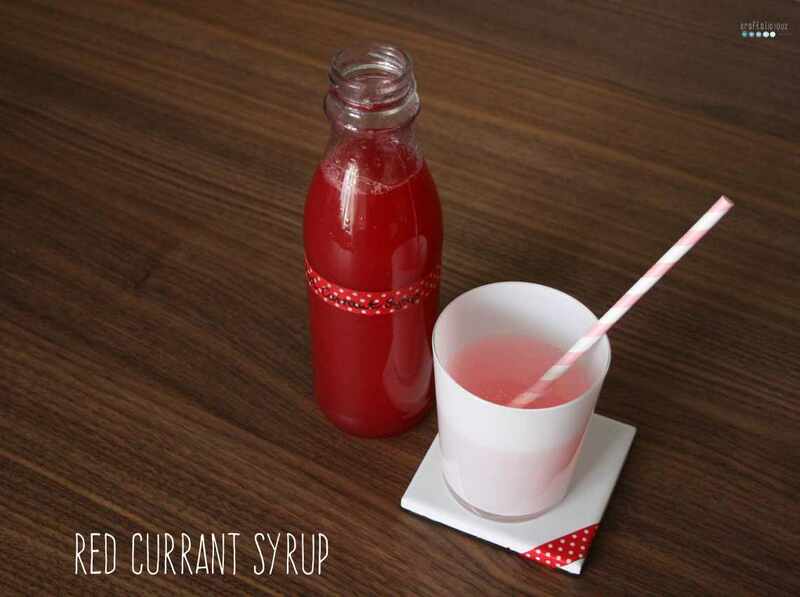 Enjoy your homemade red currant lemonade! P.S. 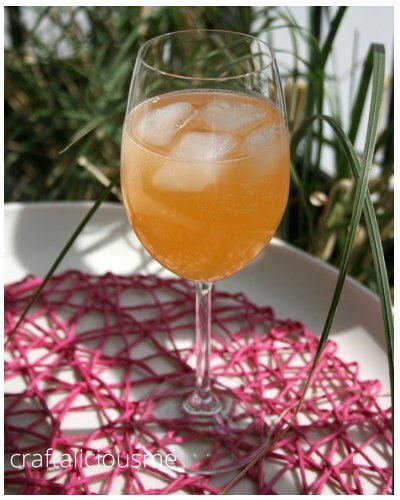 For more lemonade recipes check out my lemonade party. I have to make a confession. I kinda love the United States. Surprise surprise. By now you probably have read that I lived in the U.S. for a year. And after I tried all the different drinks I realized – they are actually too sweet for my taste. Of course I still love some Mountain Dew (never ever pour it into a glass – it looks like poison!) or a Dr. Pepper. But ALL THE TIME? Not really. I really don’t like plain water that much either. So I was kinda happy when I realized Iced Tea is nothing like Ice Tea we know from Europe. 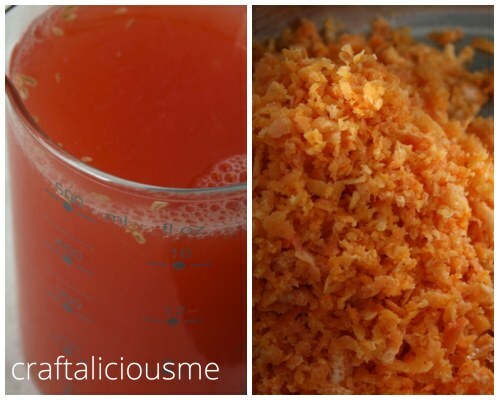 First the boring part: you need to grate all the grapefruits so you end up with lots of zest. This may take a while (to be precise 2 episodes of CSI NY). But it’s essential for the intensive flavor. 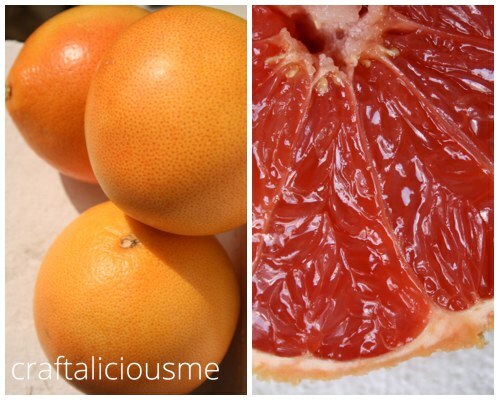 Then press all grapefruits. Pour juice, water and sugar into a pot and start boiling. Let simmer for a while. Still hot pour into glass bottle (make sure to rinse with hot water before), screw tight, turn upside down (to seal the lid with vacuum) and you are done. 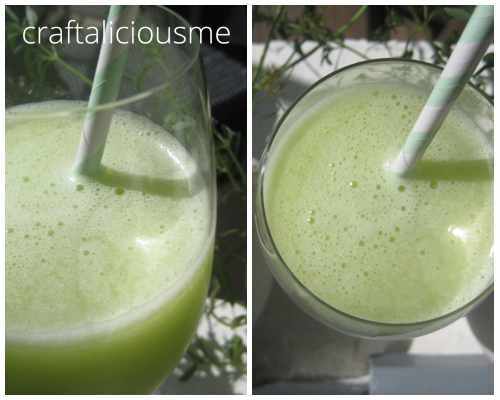 So simple, so yummy, so refreshing on a hot summer day. Have you ever made lemonade yourself? What’s your secret recipe? I have promised my favorite pink lemonade. Change of plans. It is too hot and this lemonade is a real refresher. I came across this recipe when planning my waffle-lemonade-party-bash. And it’s one of my favorites ever since. And sooo easy. When I first read the ingredients for cucumber lemonade I was not sure at all. This is supposed to taste good? 1. 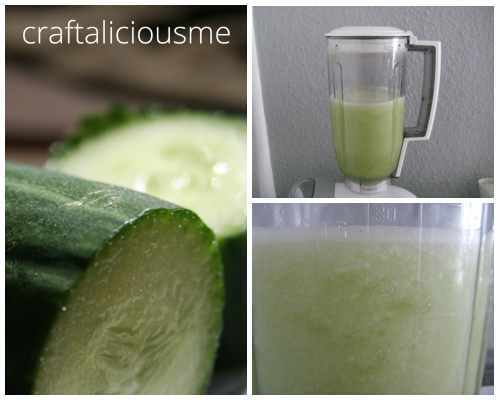 Add water, sugar and cucumber into a blender and puree. 2. Add lime juice and agave sirup and mix well. Advise: Really do add the agave sirup! This is the secret to the drink. It taste so yummy. If your worried it will get too sweet, leave the sugar. You know what the best thing about this cucumber lemonade is? Vodka! When the sun sets and you enjoy the heated summer night on your balcony, terrace or at a picnic at a lakes shore, add a splash of vodka and life is just great. I will be patiently waiting until it’s time to add some booth and enjoy the rest of the sunday. All of you have a great start into the next week. Temperatures will be high again today. Isn’t that the best time to have a cool drink in the sunshine? 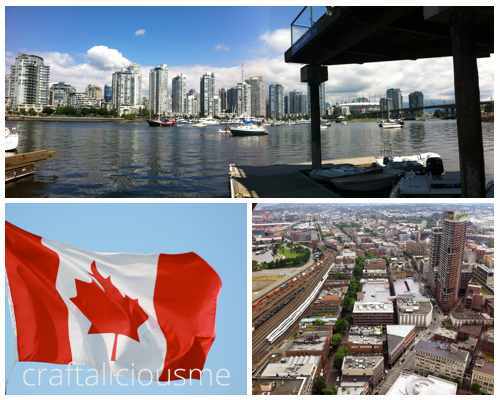 Last year around this time I have been spending 10 days in Vancouver. In Canada Ginger Ale is everywhere. I believe it is even more popular than Coke. So no suprise when I tell we drank a lot. Coming back to Europe we were kinda missing it. 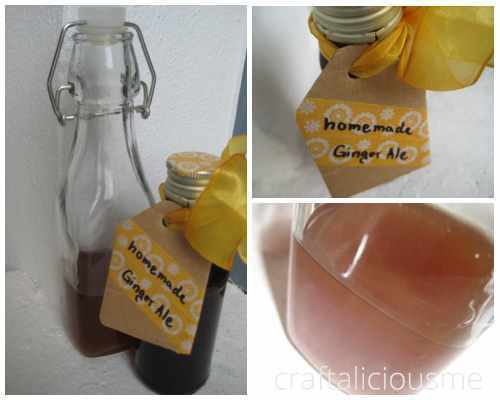 So I figured why not make some homemade ginger ale. Peel and cut the ginger into slices. Put in a pan and add water. Let rest for a while. (I believe the syrup will be more gingery – I honestly have no clue if that is true). Start cooking for about 30 minutes until the ginger is soft and feels like cooked potatoes. 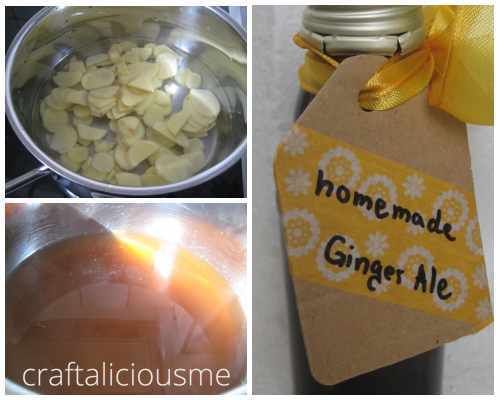 Remove ginger from pan and add sugar and lemon juice. Cook for another 15 min until consistency is syrupy. Still hot, fill into glass bottles and have them stand upside down for 15 minutes (this vacuums the bottles). Edit: I used brown sugar because I figured it would be a nicer color. I later read that brown sugar will cover the spiciness of the ginger. So I will give it another try with regular sugar. Because for me it is too sweet and not spicy enough. But I guess you need to figure that out on your own. Also check out the mint syrup and rhubarb syrup in our little summer lemonade party. I think next up will be pink lemonade – another favorite I only get in the U.S.
kennt ihr das: es ist Feiertag und man kann ausschlafen! HA Pustekuchen. Stattdessen machst du die Augen auf, denkst mhm schon so spät, schaust auf die Uhr, 6.44 Uhr. WAS?! Ich muss weiterschlafen. Heute DARF ich doch ausschlafen. 7.30 Uhr Mist immer noch wach…. 7.44 Uhr Kaffeemaschine anmachen. Nun gut es ist wie es ist. 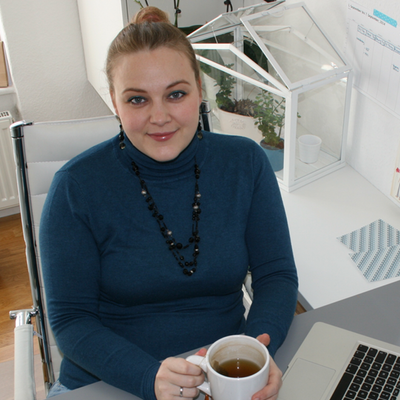 So hab ich Zeit mich, um meinen Blog zu kümmern. Gut für euch. Ich schieß direkt noch ein Limo Rezept hinterher. Minz Sirup für zauberhaft sommerliche Drinks. Und die Queen wird so was von neidisch sein. Versprochen. 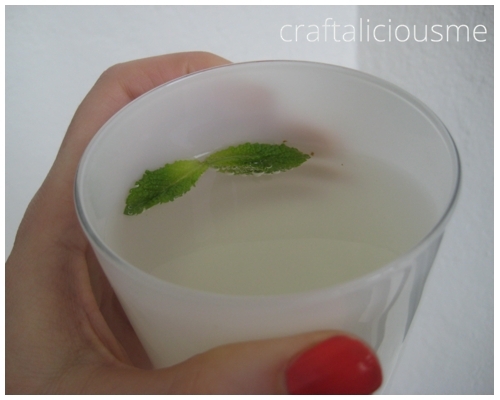 Zitronensaft und Wasser vermengen. Minze dazu. Etwas ziehen lassen. Aufkochen bis die Blätter gräulich werden. Abgießen. Zucker dazu und einkochen lassen ca. 15 min. Sofort heiß in sterilisierte Flaschen füllen. Auf den Kopf stellen zum verschließen. Habt einen schönen Feiertag. Ich fahr heute Abend zum Spargelessen (mhm kommt mir irgendwie bekannt vor). Ratet mal was mein Gastgeschenk ist. do you know this feeling? It is a holiday and you get to sleep in. HA, thats what you thought. You open your eyes, mhm is it that late already, you look at your alarm clock. 6.44 am. WHAAAT? I need to sleep in! I am ALLOWED to sleep in. 7.30 am. Still awake. 7.44 am … starting the coffee machine. Well it is as it is. Good for you. I have time to blog. 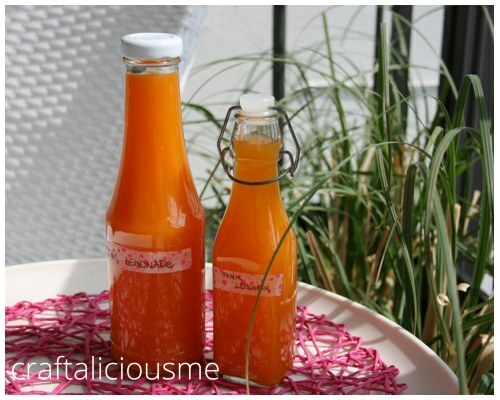 ;-) So here it is – another syrup for those lemonade parties. 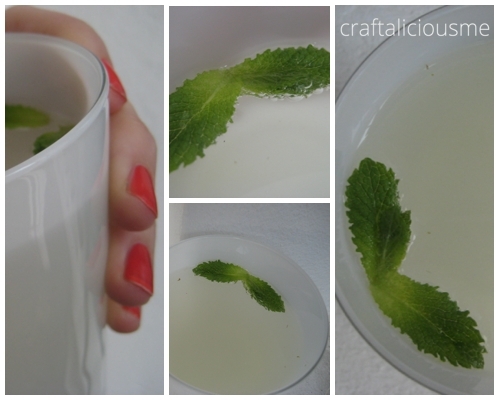 Mint syrup. Do you hear the summer calling? The queen will be jealous. Promise. Combine water and lemon. Add mint leaves and let soak for a while. Boil until mint leaves loose color. Pour through strainer. Add sugar to liquid and start boiling. Let simmer for about 15 min until liquid becomes sirupy. Fill hot into sterilized bottles. Turn upside down to seal. I just realized I do not have a photo of the sirup itself. Mhm sorry. Drank it all already. HIHI. Well I’ll be off to an asparagus eating invite. Have a great Fathers Day (when ever that is in your part of the world).